By stumps England, who won the toss, were 266-3, with Collingwood unbeaten on 98 and Pietersen 60 not out. 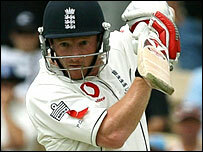 Collingwood came in with the tourists 45-2 and joined Ian Bell (60) to put on 113 in 40 overs for the fourth wicket. Pietersen pulled Lee for four second ball and lofted Shane Warne for six to lift the run-rate late in the day. Collingwood fell for 96 in Brisbane last week but it was Pietersen who had the late scare, top-edging a hook in the final over which Glenn McGrath could not get to. For the second successive innings in this series it was Collingwood who led the resistance against Australia, some typically obdurate batting taking him to the brink of a maiden Ashes ton. It was never particularly pretty from the Durham man but he showed the kind of application many of his colleagues have been lacking on this tour. It was crucial because at a venue where Australia have not been bowled out for less than 400 in their first innings in the previous seven Tests, England knew winning the toss and making a big score was vital. The wicket turned out to be as good as expected and there was little on offer to the bowlers, but the batting left something to be desired as all three wickets fell to ill-advised shots. Andrew Strauss played around his front pad and lobbed a catch to mid-on, Alastair Cook groped at a ball that moved slightly off the seam and Bell perished trying to hook Brett Lee. The run rate crawled for much of the day, with England making their way to 158-3 in the 62nd over, not helped by the idiosyncratic dimensions of the ground. Shots steered behind square or driven in the V between cover and midwicket often brought just three rather than the usual boundary. Pietersen pepped up proceedings in the evening session, though, and resumed his love-hate rivalry with Hampshire team-mate Warne. Australia asked part-time spinner Michael Clarke to bowl 10 overs before taking the second new ball, a role Pietersen could be asked to fill for England. The tourists surprised many when they opted for an unchanged side, keeping Ashley Giles in preference to Monty Panesar with James Anderson retained. 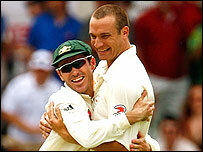 Captain Ricky Ponting also named the same XI that won the opening Test by 277 runs in Brisbane. He pronounced McGrath 100% recovered from a problem heel but the veteran strike bowler lacked his usual bite as his pace dropped regularly below 80mph. Clark was preferred to McGrath with the second new ball, with Australia clearly impressed by his early performance, when his first five overs brought figures of 2-7. Strauss would have been disappointed not to have moved on after a watchful first hour but at least he showed he had worked on the pull shot that saw him dismissed twice in the opening Test. Cook looked more assured, although he only just survived on one, when an edge off Lee fell just in front of keeper Adam Gilchrist. As an equal partner with Collingwood, Bell survived 148 balls but looked far from comfortable against Warne, even though the spinner was below his usual high standards. Bell reached his second fifty of the series from the ball after Collingwood in the final over before tea - taking 140 deliveries in all - but could not continue into the evening. Looking for a third boundary in an over from Lee he pulled a ball that was not short enough, gaining a top edge high in the air for the bowler to collect. After a more buoyant final stand, England will have been happy with their day's work but they went to stumps only halfway to the sort of score they need to dictate terms.